In the centre of Woking in Surrey, is the Borough Council Office Complex. Hidden away in the basement is a 1980’s era Nuclear Fallout Bunker. Woking Borough Council relocated to their current building in the early 1980’s. As was the norm for the time the Home Office required Regional County and Borough Councils to make preparations for Continuance of Government and Civil Defence/Protection by building Radiation Proof Shelters that would act as emergency control points in the event of a nuclear crisis. The Woking Bunker was commissioned in 1982 in the basement of the new building and the building and the bunker were designed by a Mr Freeland and the bunker was constructed by a company called Waites using designs and ideas heavily influenced by the Swiss. 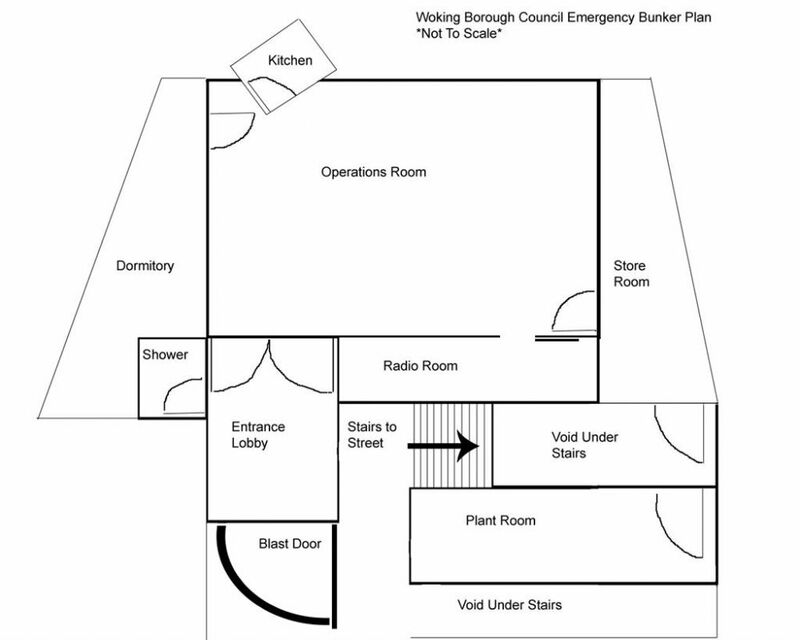 On a side note Woking Borough Council only received a pittance from the government for building the bunker which was highly unusual at the time with many councils receiving between 75% and 100% funds for bunker building. The bunker is in the basement of the modern building and is a somewhat unusual shape as it has been ‘fitted in’ with the rest of the design of the building. The bunker was never designed to be a Blast proof bunker but more of a fallout proof shelter – to this end it was equipped with only 1 blast door and none of the usual dog leg corridors etc etc so commonly found. 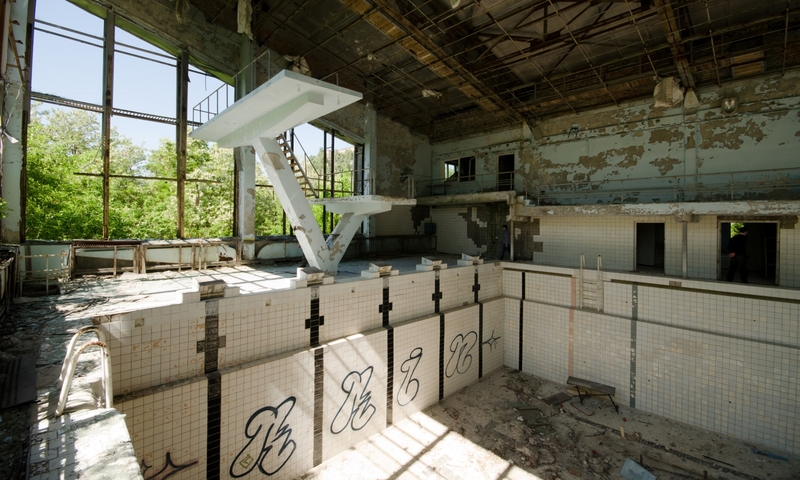 It was to be manned by 30 people who would stay in the bunker at all times during a crisis, there was a small kitchenette, dormitory (which operated a hot bed system), shower room, radio room, a lister 100kVa emergency generator and Luwa 100% air filtration plant as well as the main operations room. Interestingly there was no emergency exit and the main blast door opened outwards. In the event of the main building collapsing you would in effect be trapped in the bunker. The reasons for this were that the emergency escape tunnel would have been difficult to build at the time of the bunker being commissioned and that the blast door is better opening outwards as it provides improved protection against blast. The argument was that once you were past the blast door there were 2 separate ways out the building from there. The bunker was never meant to be immediately ready to go but served a rather more dual role function, mainly used for storage of furniture (the blast door says furniture store on it!) with the idea being that nuclear war would build up over a period of days or weeks which would enable the bunker to be cleared out, stocked and made operational. The bunker fell into disuse slowly and is now used purely as a store area, the decontamination shower, generator and air filtration plant are all decommissioned – however all the radio kit remains intact and in working order. Woking Civic Centre Offices still act as the central emergency planning control but their focus is solely on civil and natural emergencies such as flooding and other such emergencies.